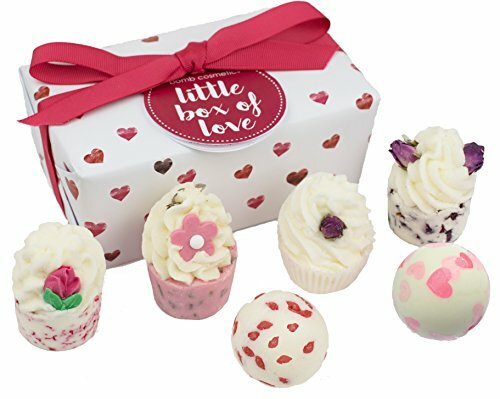 The most romantic Bomb Cosmetics Ballotin gift set, containing six of Bomb Cosmetics best selling Cocoa and Shea butter based bath melts. Set includes: Love Buds Mallow Chic & Cheerful Mallow Urban Rose Mallow Kiss me Quick Creamer Love Junkie Creamer Rosebud Buttercup To use: Drop your Bomb Cosmetics Bath Melts into a warm bath and it will fizz softly, releasing its moisturising Cocoa and Shea Fruit Butters into the water to moisturise your skin. Our Bath Melts also contain wonderful perfumes and essential oils to make your bath smell beautiful. Please ensure you wash any petals away from the bath after use to prevent accidental staining. Not suitable for small children under 3. Do not consume. Rinse bath well after use.